CARVED WOODEN NOVELTY AUTOMATON SELECTION CIGARETTE BOX MOVING WOOD SMOKING. Condition is Used. Dispatched with Royal Mail 2nd Class. ANTIQUE, LEATHER BOUND FOLD OUT WOODEN CIGARETTE CASE. NICELY MADE WITH GOLD TRIM AND HIGHLIGHTS - TO HOLD 24 CIGARETTES. SOLD AS SEEN. 1 Cigarette Holder - Bruyere. wood / root. FABERGE ?? RUSSIAN BURL WOOD CIGARETTE CASE STUNNING!!! THIS AMBER COLOURED CIGARETTE CASE IS FROM 1870-1917. BEAUTIFULLY CARVED (near invisible hinge),A VERY SMART FINGER LIFT AT FRONT OF PIECE MAKE THIS A VERY STYLISH FINE ITEM. IT IS IN THE MOST STUNNING CONDITION. This listing is for a great carved wooden cigarette box and dispenser. Crafted in India during the 2nd half 20th century. Plinth mounted hinged lid cigarette box decorated with carved floral and geometric designs with an opening dispensing drawer operated by a push handle. This action causes bird to peck and pick up a cigerette fro the drawer. Modern cigarettes do fit in the box and dispense but are too fat for the bird to pick up. Lovely folk art item in great vintage condition with no cracks or splits etc. Some fading present to colour and does show signs of age and light use, please see photos. Great decorative items. Weighs 368 grams. Measures 17cm long x 9cm high x 10.5cm wide. Thanks for looking. Wonderful tiered display cigarette box. A fantastic addition to any Cigarette Box Collection. THIS A LOVELY RARE ORIGINAL ATAAHUA BOX WITH PAUA SHELL DECORATIVE INLAYS AROUND LID TOP AND A LINE AROUND ITS BASE. HOWEVER STILL FIT FOR PURPOSE AND A GREAT COLLECTORS ITEM. LIFT UP LID. LOVELY WOOD SPECKLED GRAINING INTERNALLY. 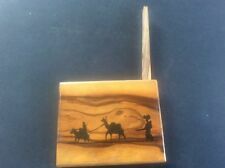 Wood Cigarette Pipe Holder Case Collectors box. Great for collector. Looks well made. AMAZING CHINESE FINE CARVED WOOD CIGARETTES TABLE BOX DESIGNED WITH DRAGONS The box opens up and holing 40pices cigarettes it has brass hinges, carving all over the box. Vintage Wood Cigarette Case. Condition is excellent. Dispatched with Royal Mail 2nd Class. Rolling Box With Magnets Amsterdam. Fresh from the streets of Amsterdam never used and selling for cheap! Unique design only found here or in Amsterdam. Perfect for storing smoking accessories. Condition is New. Dispatched with Royal Mail 2nd Class. Light wear as per picture, appears to be handmade, although quite a good job has been done, leaving a nice snug fit to the lid. WE HAVE NO FACILITIES FOR COLLECTION. Leather Bound Cigar Case With Cedar Wood On The Inside. Room For Two Cigars Side By Side. 1X wooden cigarette case. Material: Wood. Notice: The Smoking pipe is Not included. Details:Pipe Bag. Quantity: Include 1pcs Bag. Low Prices. Portable Wooden Cigar Tube Storage Case Humidor Tobacco Cigarettes Holder. One Piece Wooden Cigar Pipe Tube. - Material: Wooden. Due to the different display and different light, the picture may not reflect the actual color of the item. Round Wooden Cigarette Holder Box Case Organizer for Jewelry Storage. - Creative design, how your elegant taste. 5 Pieces Wooden Box Case. One Piece Wooden Cigar Pipe Tube. - Material: Wooden. Due to the different display and different light, the picture may not reflect the actual color of the item. Easy to carry with your favourite cigar when travelling with safe and protecte. Capacity:Holds 3-5 Cigars(Depend on cigar ring gauge). Material: Leather, Adjustable Cedar Wood. Length: Approx. - Portable Wooden Cigar Tube Storage Case Humidor Tobacco Cigarettes Holder. One Piece Wooden Cigar Pipe Tube. Due to the different display and different light, the picture may not reflect the actual color of the item. 1 x Cigar Case. Material: Cedar wood, Leather. Color: Brown. We believe every problem can be resolved. Capacity:The Case holds 6 cigars. Notice: The color of the case may slight different from the pictures because it depend on the raw material's color of each batch. Antique Handcrafted Wooden Cigarette Case. Note: We would love to hear about the concerns to make your experience better! Wonderful gift item.